This ancient site has a potential timeline dating back as far as the Bronze Age.Certainly pre-Christian and possibly an Iron Age settlement, it later became known as a burial place of Saints. Early stones, one with a Romano-British inscription, point to an earlier tribal occupancy. These stones now form an alignment at the back of the church, though it is possible, as suggested by early documents, that they too may have once sat on the burial mound, marking a much earlier ancestral grave. 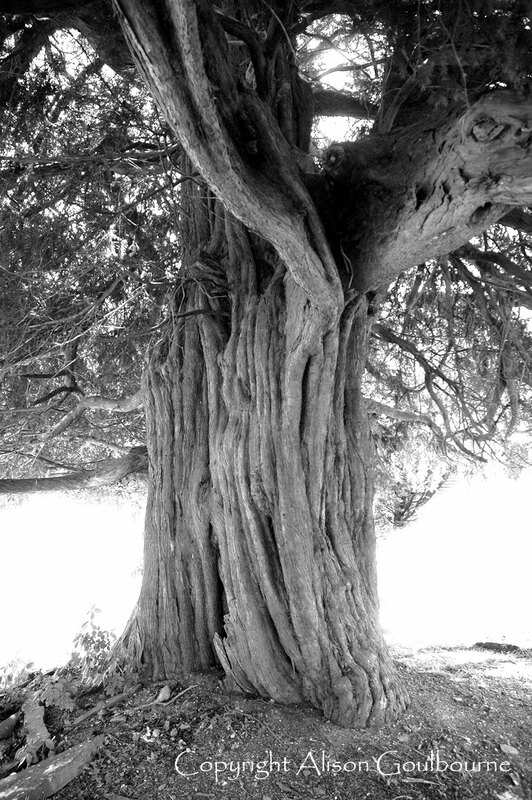 The ancient yews, perhaps 2500-3000 years old, are typical of a former sacred gathering place, and are some of the best examples in North Wales. The legends hold that Gwenfrewi (pronounced Gwen-VRE-wy and anglicised as St Winifred) came to Gwytherin to live alongside her cousin Eleri who had set up an early Christian clas or collegium with his Mother Theonia. Gwenfrewi eventually became abbess over this early community and it was here that she is said to have died and was buried in an enclosure now known as Penbryn Chapel, formerly CapelGwenfrewi. This is also recorded as “The Saints’ Graveyard”, where numerous saints were believed to have been buried: these include St Sannan and St Cybi, as well as St Eleri, his mother Theonia and St Gwenfrewi herself. All this, recorded in early medieval documentation, would have been informed by oral traditions. It was here, 500 years after her death, that Prior Robert and seven monks are reported to have travelled to take away the bones of Gwenfrewi to Shrewsbury in the 1130s so as to attract pilgrims to their newly founded abbey. This in itself indicated the importance of Gwenfrewi in these early times. Prior Robert wrote a translation report, now in the Bodleian Library in Oxford, describing his journey to Gwytherin and the translation of the bones, including the opposition he encountered by the inhabitants, interestingly welsh legend upholds Gwenfrewi remains in Gwytherin. There was a reliquary box at Gwytherin called the Arch Gwenfrewi, drawn at the chapel site by Edward Lhuyd in 1668 which also indicates the importance of Gwytherin as an early pilgrimage destination dedicated to what must have been a very important female saint. The Arch (‘chest’ in Welsh), a rare link to the past, was all but destroyed by a priest selling off parts of it as relics, with only a few pieces surviving. Indeed, a piece was still described as being here until relatively recently, later disappearing. The drawing by Lhuyd is also preserved in the Bodleian. The Anglo- Saxon design of the roundels on the box point to its being a pre-Norman Conquest artefact. It has been suggested that the box may have dated back to the 8th-9th century, which would confirm Gwytherin as a place of pilgrimage and religious importance from a very early date. The stones that now reside in the church form some of the few remaining links to the chapel site and Gwenfrewi’s Chapel. The gravestone now in the wall by the altar was at one time recorded as having been placed over Gwenfrewi’s grave at a much earlier period. A recent PhD dissertation by James Ryan Gregory traces the stones and the history of the site using all medieval documents available: this work is the most thorough investigation to date and a copy of it has been kindly gifted, to be kept in the church. Until recently there was also an ancient oak chest, which shortly after the closure of the church in 2004 was removed to Holywell/Treffynnon. This is in some ways unfortunate as it was very much part of her cult and tradition within the history of Gwytherin, and may at one time have housed the original reliquary box. It may be that relics have be taken away to draw pilgrims elsewhere, but it was to Gwytherin that Gwenfrewi chose to come, where she lived alongside her friends and where she was buried, and where her tradition has meaning now. Gwytherin holds a very special place in Gwenfrewi’s story, one that should be remembered. The Welsh, like all early British Christians, always believed that the burial of a saint provided a spiritual protection to that community: this could be a practice going back to the Bronze Age. Many came to Gwytherin from the time of her death either in hope of a healing or to visit the place Gwenfrewi lived and died. This continued after the so-called translation and Gwytherin remained a place of spiritual importance, a further testament to this being of course the drawings, relics and early documentation. The Gwenfrewi Project was set up to help preserve this tradition in Gwytherin,with its layers of history from the Bronze Age to today. In preserving a neglected ancient burial mound, at one time inaccessible and used for grazing cattle, and in restoring a church that was left empty for five years to slowly deteriorate, I feel we have taken positive action to preserve what was and still is a very special and inspiring place. I hope to continue to preserve these links as sensitively as possible,leaving room for everyone to think and feel as they want, and in doing so provide a stunningly beautiful place to just sit, explore, wander, imagine and create, without all the usual brandings and trappings. The feeling inside I hope will echo something of the beauty felt outside and all around this sacred site: the idea is to keep things pure and to provide freedom to think and feel as you wish without any historical statements being too visible. History is amatter of perspective and is often written for a political reason and gain. The Gwenfrewi Project, while remembering the past, is very much about creativity and the now. If you walk amongst the ancient yews, the inscribed stones, and look at the stunning hills all around you I am sure you will be moved by all that has made this site special... imagine how many people have passed this way before you, walking the mound between these sacred yews, gathering and celebrating. There is information in the porch for hungry historians and those wishing to learn more about the project. How you feel and what you feel is your own journey.